SchoolCity SUITE allows users at all levels to create groups of students and groups of courses for various purposes. District and School Level Users may also share their Student Groups and Course Groups with other users. Student Groups and Course Groups created by Teacher Level Users are always private and cannot be shared. c. Student Groups that have been created by the user will be listed with an open box, the Group Number, Group Name, Number of Students, Created By, Date Created, and Date Edited. e. Teacher Users, when a School or District User shares a group semi-privately or publicly with you, it will appear on your list without an open box next to the Student Group name, and with only a View (eye) icon. You cannot make any edits to this Student Group. d. Course Groups may be created and kept Private (only the creator can view), Semi-Private (only selected users can view), or Public (all users can view). e. Teacher Users, when a School or District User shares a group semi-privately or publicly with you, it will appear on your list without an open box next to the Course Group name, and with only a View (eye) icon. You cannot make any edits to this Course Group. a. From the SchoolCity SUITE Launchpad, click on the Navigation Grid, and select Admin. b. Or, from the Launchpad, click on the ADMIN Flip Card, and select District Defaults. c. In District Defaults, select the System Properties tab. 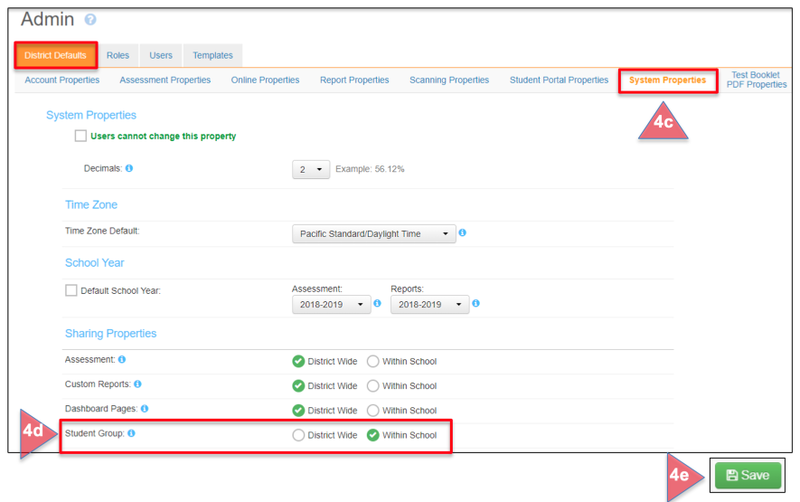 d. Under Sharing Properties, click on the desired sharing settings for Student Groups District Wide or Within School. District Wide allows users to share with the entire district, selected Schools, Grades, or Users. Within School allows users to share with the entire school, selected Grades or Users. e. Click Save after making any changes to the settings. Please refer to the Help documents, Groups: Creating Student Groups, Creating Course Groups and Managing Student and Course Groups for more information.